The linen coat came from Goodwill, but it was fully lined. Which I removed-- way too hot in the desert for a lined jacket. However now it's very comfortable here in our local 90 degree heat. I used to be fairly good with a sewing machine back in my college days-- I couldn't afford to buy mountain/trail hiking gear, so I learned how to use a sewing machine and made my own. However my daughter's modern machine is more like a CNC device-- a computer sewing machine hybrid-- so I just stuck to a simple basting stitch. The black edge material is woven and probably designed for strapping use. Anyway, it worked fine. I made a Number 2 button template and made them in all sorts of different sizes. The badge on the jacket is laser printed, then front laminated with acryic and edge sealed, and finally epoxied onto a hand made aluminum disc with a pinback also epoxied on. For decoration, I used black satin ribbon and did a ripple edge around the perimeter, using cyanoacrylate adhesive (e.g. superglue). The umbrella top two Number two discs are done the same way, only in a different size to keep them from interfering with the deployment of the folding seat and the umbrella. I also made a large Number 2 disc for the folding base/top (depends upon whether or not you're using it as a seat or an umbrella). 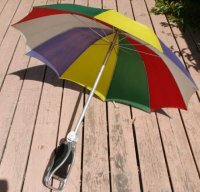 The umbrella was originally purchased for two or three dollars from Goodwill, and was stamped "Made in England" on the aluminum seat section (no manufacturer shown). It was designed as a portable seat, and didn't have an umbrella. It was also missing the leather for the seat, so I cut some new leather, dyed it black, and riveted it at the ends. 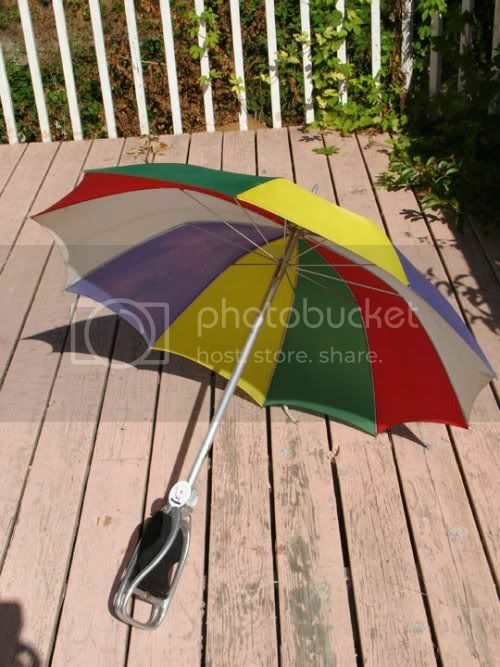 I looked, but couldn't find anyone who sold replacement umbrella components in the 1/2 inch diameter of the folding seat. 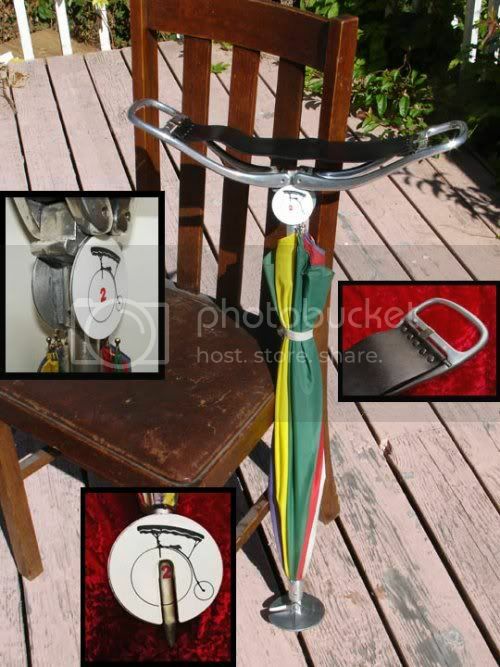 However, while digging through my dad's old golf stuff, lo and behold, I fould a thirty year old golf umbrella with a half inch diameter shaft, exactly matching the diameter of the shaft of the folding seat! I had to go and buy a new piece of aluminum tubing, slot it to match the umbrella cutouts, and was able to adapt it perfectly to the folding seat. 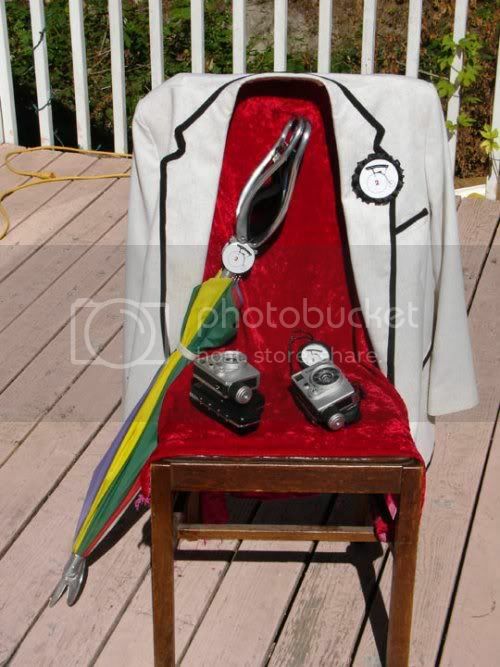 Other stuff in the photos are a few of the old windup Canon cameras (apparently they were unaware of how the cameras actually worked when shooting The Prisoner). I don't know if they work or not, because they require a 1.3 volt mercury cell, and I haven't had time to string a bunch of large button batteries with diodes to regulate the output (the reason mercury cells were often used for light meters, etc is because they delivered very exact voltages for the life of the battery.) 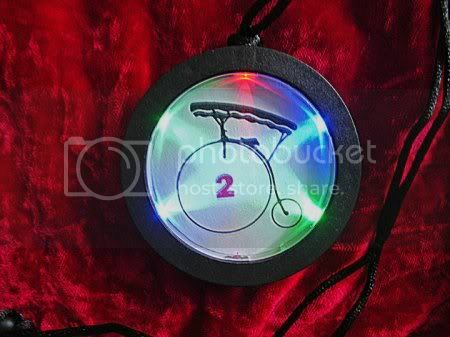 Lastly, I made a lightup medallion to stick on the bicycle I'll be using on the desert. The bike will also be covered with EL wire, because visibility is crucial in the middle of the Burning Man playa if you don't want to get run over by some stoned Ninja.